Kim Lacharite, Executive Director, Learning Transformation, Ministry of Education. At this 30 minute meeting we presented the petition calling on BC to implement TRC Call to Action #62.1. Read more. In 2018, KAIROS updated the Education for Reconciliation Report Card to reflect the progress of each province and territory in implementing Call to Action 62.i. KAIROS is pleased to report that most provinces and territories have made progress. While no jurisdiction has fully implemented Call 62.i, some are close. KAIROS acknowledges and thanks those volunteers who have advocated for the full implementation of Call 62.i and continue to do so by collecting petition signatures, contacting their elected officials, and meeting with education ministries. 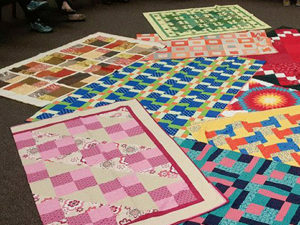 To date, petitions were presented in the legislatures in Nova Scotia, Ontario and Alberta, with more to come. 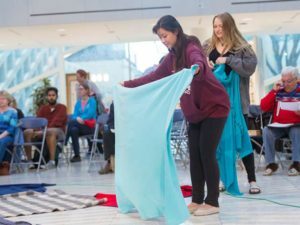 The Winds of Change have been active in Manitoba and British Columbia thanks to the efforts of local KAIROS organizers. In Manitoba, the KAIROS Cambrian Agassiz group met with the Manitoba Ministry of Education and Training on August 25, 2017. 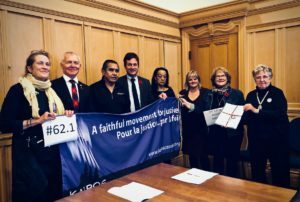 In BC, the KAIROS Metro Vancouver group collected nine full petition sheets of signatures in support of the Truth and Reconciliation Commission’s Call to Action #62.i during the Walk for Reconciliation, which drew an estimated 25,000 people. Read more. 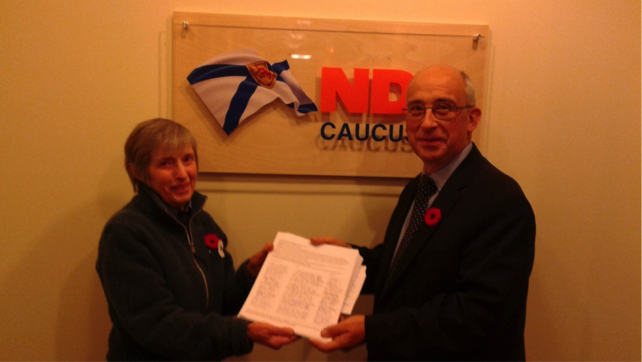 November 8, 2016: Linda Scherzinger, KAIROS Halifax, delivers 1700 signatures to Gary Burrill, Leader of the Nova Scotia NDP prior to presentation in the House of Assembly. November 2, 2016: Petition tabled at Ontario Legislature. 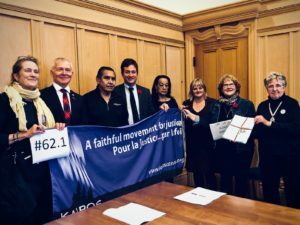 Over the past few months the KAIROS network in Ontario has collected over 10,000 signatures, worked with MPPs, and collaborated with other groups to organize education and advocacy events, including a Mass KAIROS Blanket Exercise at the Ontario legislature in June. This week, a question related to the campaign will be submitted in the legislature, more petitions will be tabled, and KAIROS staff will meet with the Minister of Education’s staff. Read More. 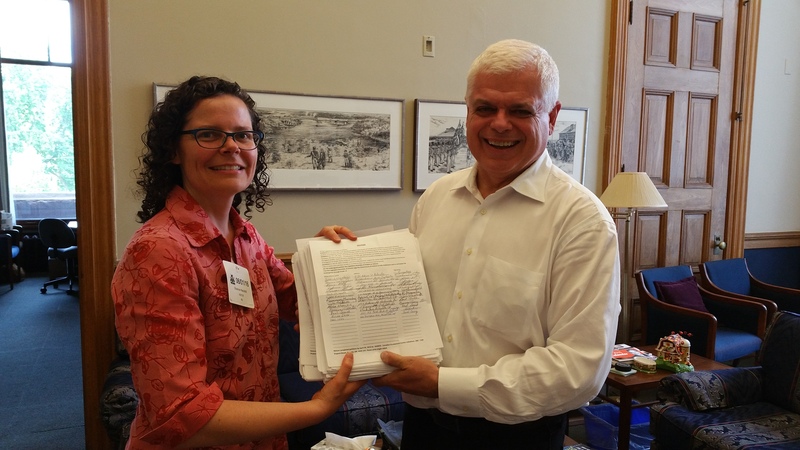 MPP Peter Tabuns (Toronto Danforth) agreed to tablethe bulk of 9500 signatures received so far in Ontario for the Winds of Change petition. Tabuns invited a KAIROS delegation to be his guests in the Member’s Gallery to witness the presentation. 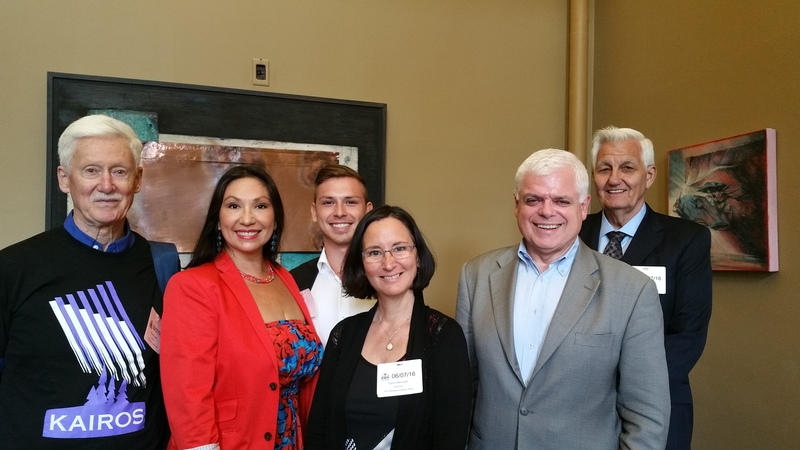 In the end, MPP France Gélinas (Nickel Belt), the NDP Critic for Aboriginal Affairs read, signed and tabled the petitions on June 7. On May 17, MPP Steve Clark (Leeds—Grenville and Deputy Leader, Official Opposition) tabled several pages of the petition he received from his constituents. On June 6, MPP Ann Hoggarth (Barrie, Liberal) and MPP Daiene Vernile (Kitchener Centre, Liberal) each tabled our petition. Vernile told the Legislature she held hundreds of signatures. MPPs must sign any petition they table. The petition has been tabled by members from all three parties of the Ontario Legislature. JANUARY 14, 2016: Stephen Kakfwi is President and CEO of Canadians for a New Partnership (cfnp.ca). The ninth Premier of the Northwest Territories and former President of the Dene Nation. Mr. Kakfwi is a residential school survivor and a long-time advocate for reconciliation through education. Network update by Pamela Thomson, from Redeemer Anglican Church in Toronto.